There may be instances when your institution will require the importing of assessment scores gathered outside of Chalk & Wire or legacy assessment data generated prior to acquiring Chalk & Wire as your assessment system. This workflow will walk you through how to prepare the assessment data using your own spreadsheet for importing into Chalk & Wire as well as the import process. 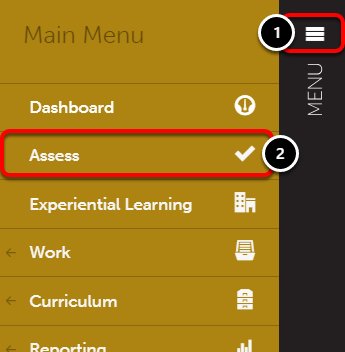 Create a spreadsheet that conains assessment date, student and assessor identifiers (name, email address or user ID), and scores for all criteria. 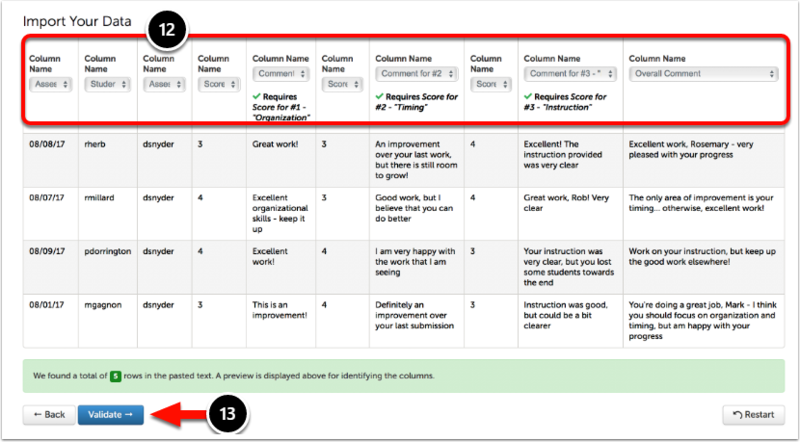 You can additionally include comments for each criterion, an overall comment, a percentage grade, and tags. 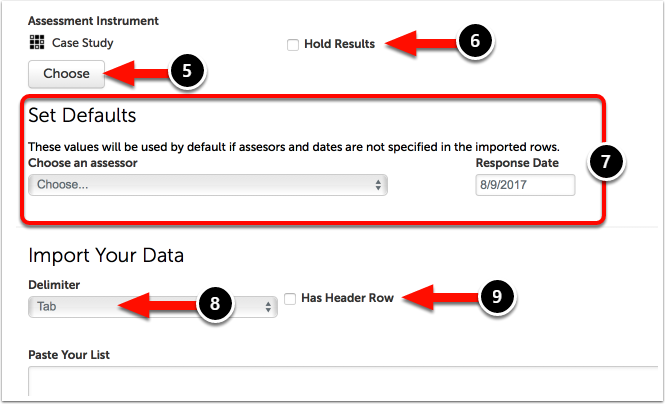 Please review the "Columns and Notes for Importing Assessments" section below for detailed information on which columns to include and how to name each column's header. Student Identity (required): The name of the student being assessed. Enter "student" for the column header. Assessor Identity (required): The name of the assessor assessing the student. Enter "assessor" for the column header. Scores for Criteria (required): The score provided for the criterion. Each criterion is numerically ordered (1, 2, 3, 4, etc.). Enter "1" or "2" or "3" or "4", etc. for the column header, depending upon the criterion for which the score applies. Comments for Criteria: The comment, if any, provided for the criterion. Each criterion is numerically ordered (1, 2, 3, 4, etc). Enter "comment for 1" or "comment for 2" or "comment for 3", etc. for the column header, depending upon the criterion for which the comment applies. Overall Comment: The overall comment, if any, provided for the entire assessment. Enter "overall_comment" for the column header. Grade: The percentage grade, if provided, for the assessment. Percentages 0-100 are accepted, as are decimal percents 0-1. Enter "grade" for the column header. This data will not be pushed to an external system. Tags: A tag or tags that are assigned to the assessment. If using "comma" as the delimiter for your import, please separate the tags within the overall tag column with a tilde (tag1~tag2~tag3~tag4). Otherwise, use a comma to separate the tags (tag1,tag2,tag3,tag4). Enter "tags" for the column header. 3. Click on the Tools icon. 5. Select the Assessment Instrument to which you are importing. 6. Select whether or not you would like to Hold the Results of the assessments. 7. Optionally Set Defaults. If you are not using header rows, or if you fail to include information under a header in a column, this information will be used. 8. Select the Delimiter for your import. The delimiter will separate the columns of text. If you are pasting from a spreadsheet, choose Tab. 9. Indicate whether or not your spreadsheet has a Header Row. 10. Paste your import content in to the import text-entry area. 11. Click on the Identify Columns button. 12. If you included header rows in your import content, the columns will already have definitions selected in the drop-down menus. If not, use the drop-down menu for each column to define it. 14. Click on the Finished. Import My Data button. Your import will be confirmed in green.